Scholarships can work as a game changer for students in transforming their academic and professional lives. It comes in different categories, but most of them have a similar application process. If you know some general guidelines for scholarship applications, it can make the process seem a lot less burdensome. Scholarship judges may spend just a few precious minutes or even seconds reviewing your scholarship application. With such a finite amount of time to make a lasting impression on these important decision makers, it’s crucial that you make the most of this opportunity. If not, your application may be on the fast track to the circular file. Do start your scholarship search early. While scholarship deadlines vary, each scholarship application is different and will require time and effort to complete before the deadline. Buddy4Study, India’s largest scholarship platform, provides information related to the deadline for all scholarships posted on the portal. Do plan on giving a fair amount of time and energy – both to finding scholarship opportunities and then to carefully completing the application for each opportunity. 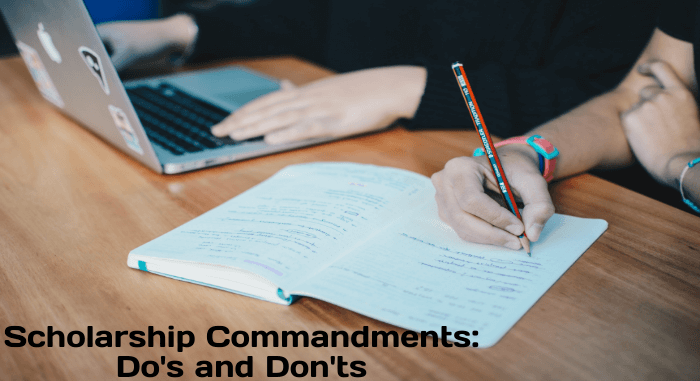 Do take the time to read each scholarship application instructions carefully – and then follow those instructions diligently. Use the same care for scholarships as you did for college applications. You don’t want your application to be turned down if you did not fill it out correctly or did not include any requested documents. To make it easier for students to understand, Buddy4Study gives basic pointers along with the links to where they can get the detailed information and instructions of a particular scholarship application process. Do make sure you proofread your scholarship application and/or essays. You know what they say about first impressions! Read how you can write the best college scholarship essay here: How to write a Scholarship Essay? Do be aware of scholarship scams. Unfortunately, scholarship scams do exist and they are difficult to recognize if you do not know what you are looking for. Do stay organized. It’s easy to lose track of qualification criteria, requirements, and deadlines when you are looking for so many details. Create a digital spreadsheet or a physical Scholarship calendar to keep track of all key information, particularly deadlines. Monitor the timeline of your Scholarship application, refferal/acknowledgment deadlines, etc. Do look closely at the companies where you or your family members work as many corporations offer scholarships to their employees and their employee’s dependents. What others are reading: How to Crack Scholarship Interview? Don’t forget to answer the question in your essay. There’s a reason why the scholarship organizations provide the essay questions. They want to know your answer. An essay can be very well-written, but if it doesn’t answer the question asked, then it’s not going to win. Some scholarship application portals that don’t have mandatory scholarship essays, test the diligence of applicant for providing complete information. Don’t assume that you won’t receive a scholarship if you aren’t a star athlete or the head of your class. There are a number of community scholarships available to those who are involved in community service and in categories you are not even aware of. Buddy4Study offers information about a wide range of scholarships including merit-based, means-based, technology-based, science and maths-based. It even provides scholarship application and admission assistance for global education as well. Don’t forget to carefully spell-check, edit, and proofread each scholarship application packet before you submit it. Whenever possible, do have someone else proofread your applications to help assure that you have made no mistakes. Don’t just apply for one or two scholarships, assuming you’ll get one or both of them. The more scholarships you apply for (assuming you meet all the qualifications), the higher the probability of you bagging one. Buddy4Study offers a plethora of scholarships; you can filter out the best ones for you as per your credentials. Don’t be discouraged if you don’t win right away. It’s important to keep in mind that applying for scholarships is a numbers game. The more you apply for, the better your chances of winning – so apply for as many as you are eligible for. After reading the do’s and don’ts, students who are looking for scholarships to pursue their dream education should log on to Buddy4Study and apply today.